This just in . . . 1919 waybill for the KENTUCKY. The picture is from an old "Real Photo" post card in my collection. Home port or owner's residence circa 1904 was St. Louis, Missouri. After she was rebuilt (1922-23) she was renamed the TENNESSEE BELLE. Her original roof bell was given to the First Christian Church in Paducah. 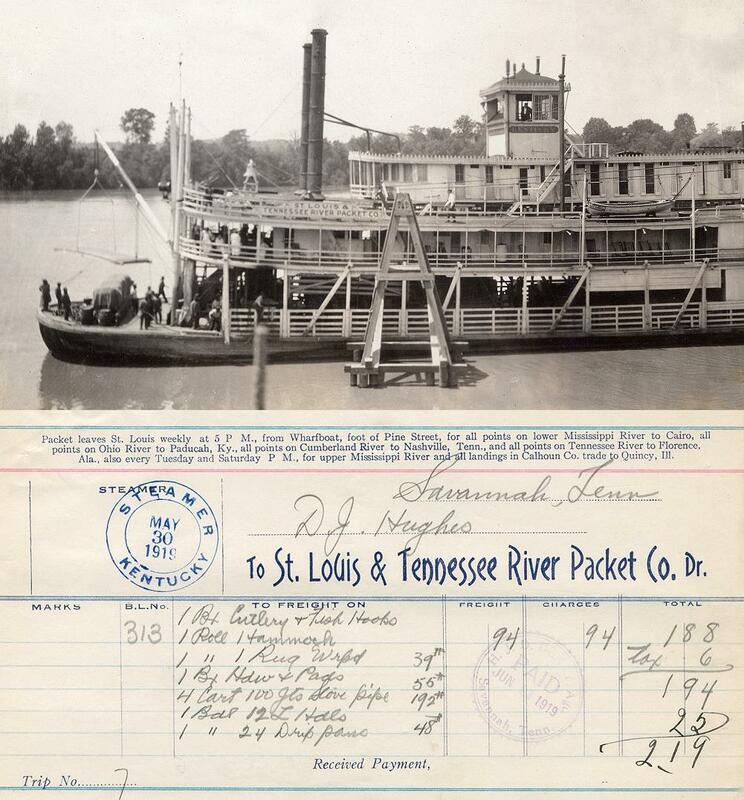 Found a 1919 waybill for the ALABAMA on eBay recently and composited it here with a snapshot of the ALABAMA at St. Louis which I found very early on after I began collecting steamboat ephemera.Nice to to have these two together as companion pieces. 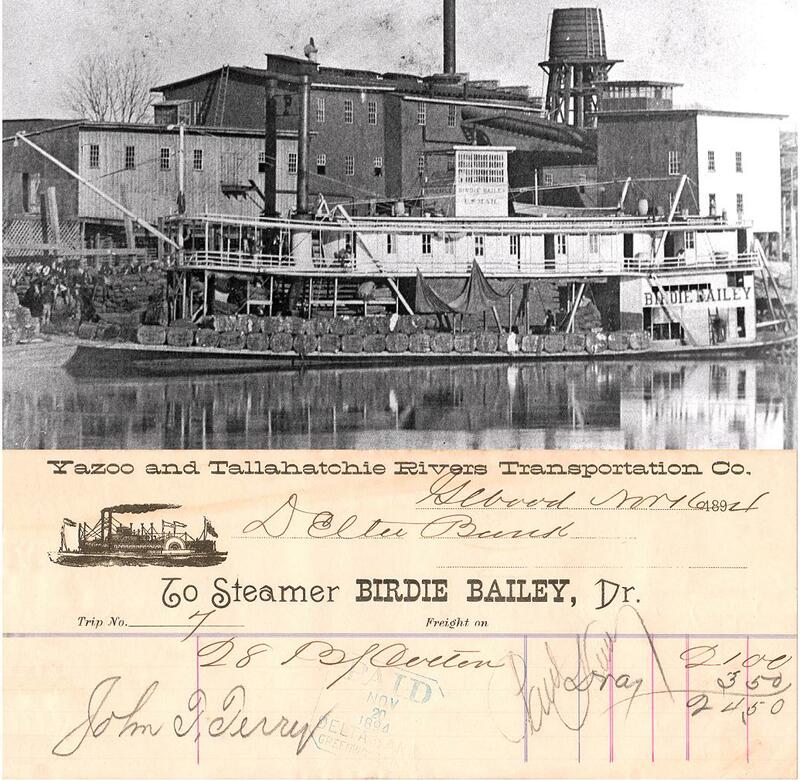 The waybill is rubber stamped "steamer Alabama" in the upper right hand corner. 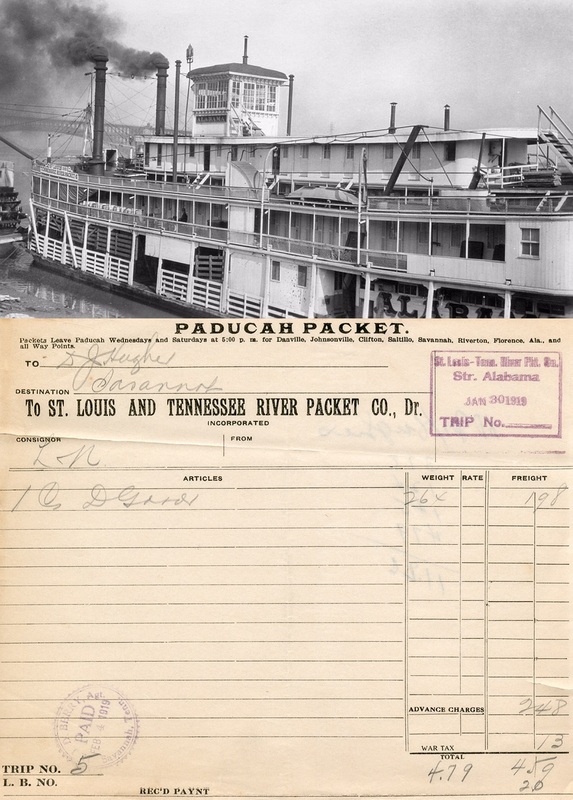 Ran the Paducah-Shiloh trade in 1929, the last regular steam packet on the Tennessee River.Was in the Cincinnati-Louisville trade under charter to the Louisville and Cincinnati Packet Company, in spring of 1931. Chartered to George Partin, Memphis, in 1932 for the Memphis-Caruthersville trade. Was retired soon after and made into a quarter boat. Attached a real gem . . . the steamboat GOLD DUST which was mentioned by Mark Twain in LIFE ON THE MISSISSIPPI. 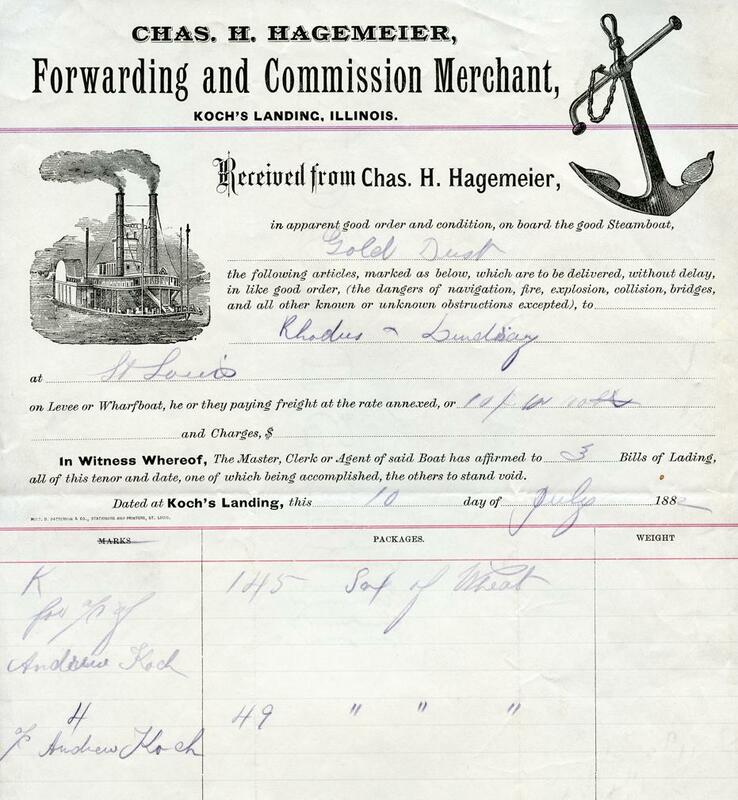 This receipt from Charles Hagemeier at Koch's Landing, Illinois is dated July 10, 1882. 29 days later the GOLD DUST's boilers exploded near Hickman, Kentucky. At the bottom of the page I've included lots of good material to accompany the waybill when you post it. I was in a bidding war on eBay because the association with Mark Twain made it a "hot item." A list of the names followed, whereby it appeared that of the seventeen dead, one was the barkeeper; and among the forty-seven wounded, were the captain, chief mate, second mate, and second and third clerks; also Mr. Lem S. Gray, pilot, and several members of the crew. In answer to a private telegram, we learned that none of these was severely hurt, except Mr. Gray. Letters received afterward confirmed this news, and said that Mr. Gray was improving and would get well. Later letters spoke less hopefully of his case; and finally came one announcing his death. A good man, a most companionable and manly man, and worthy of a kindlier fate. Fate: lost in explosion at Hickman, KY on 7 August 1882 with loss of 17 lives. Clemens wrote about the explosion and loss of the GOLD DUST in Chapter 37 of Life on the Mississippi According to Clemens, Pilot Lem Gray died of his injuries. Clemens' comments: "I take a trick at the wheel occasionally, & find the mechanical work of steering a steamboat as familiar as if I had never ceased from it." When we got down below Cairo, and there was a big, full river--for it was high-water season and there was no danger of the boat hitting anything so long as she kept in the river--I had her most of the time on his [Lem Gray's] watch. He would lie down and sleep, and leave me there to dream that the years had not slipped away; that there had been no war, no mining days, no literary adventures; that I was still a pilot, happy and care-free as I had been twenty years before. 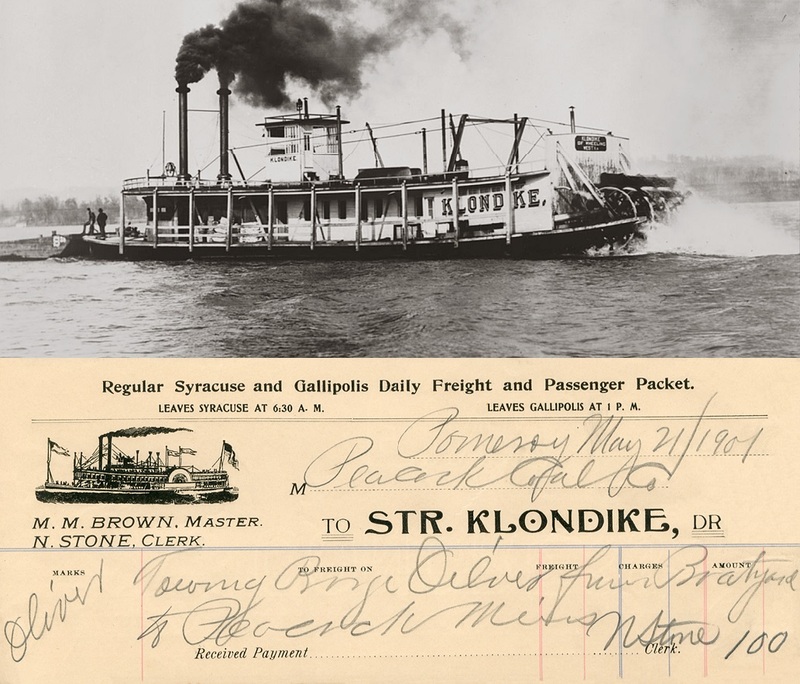 Lemuel Gray was the pilot of the steamboat Gold Dust, the boat that Mark Twain boarded in St. Louis in 1882 after an absence of 20 years from the river. He wrote the second half of "Life on the Mississippi" based on the ensuing journey. The two men had been friends during Twain's own piloting days. During Twain's trip on the Gold Dust, he lost his corncob pipe while knocking ashes over the side. Lemuel Gray sent a box of corncob pipes to Twain's stateroom to replace the lost pipe. Waybill circa 1880 owned by Kevin MacDonnell from the first steamboat named MARK TWAIN that was built in 1876. Sam Clemens saw this steamer in the mouth of the Obion River above Hales Point in May of 1882 during his return visit to the Mississippi. 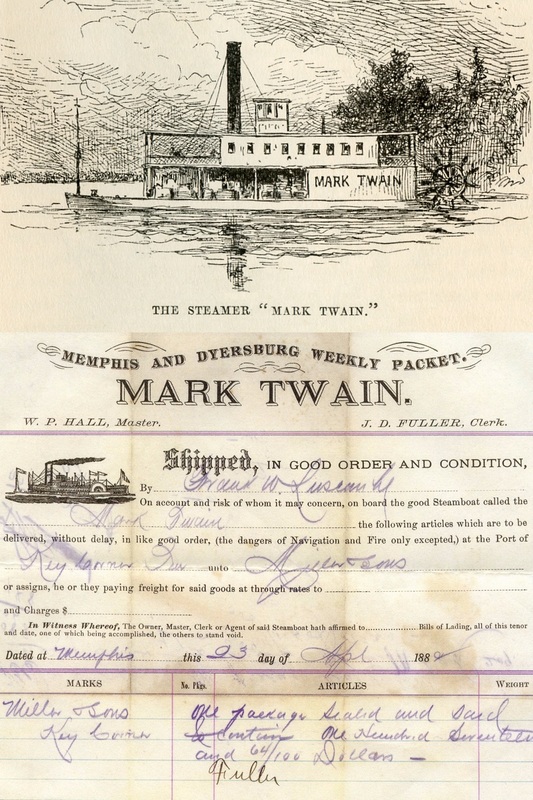 The pen & ink illustration of the sternwheeler on page 298 of Sam's book that was published the following year is displayed above the waybill. "Far along in the day, we saw one steamboat; just one, and no more. She was lying at rest in the shade, within the wooded mouth of the Obion River. The spy-glass revealed the fact that she was named for me—or he was named for me, whichever you prefer. As this was the first time I had ever encountered this species of honor, it seems excusable to mention it, and at the same time call the attention of the authorities to the tardiness of my recognition of it." Built at Jeffersonville, Indiana, 1872, originally named BUSINESS. Left Cincinnati for Memphis Jan. 27, 1877, Capt. J L. Randall. Ran Memphis-St. Francis River, Capt. W.P Hill. Later bought by a Capt. Fogleman, Mound City Arkansas, who used her as a ferry there. Her boiler exploded at Mound City Mar 27, 1885 with the loss of six lives. Rebuilt and renamed ALICE. Was still listed ALICE at Memphis in 1892 and possibly later. Launched at Mack's Yard, January 17, 1885. She received new engines and boilers, but used cranks, pitmans, etc. from the first BONANZA. Ran her trial trip on April 28, 1885. On the forward cabin bulkhead was a painting of Portsmouth, Ohio done by artist Scott Hummel. She carried the whistle formerly on the old BONANZA which had started on the ST. JAMES. 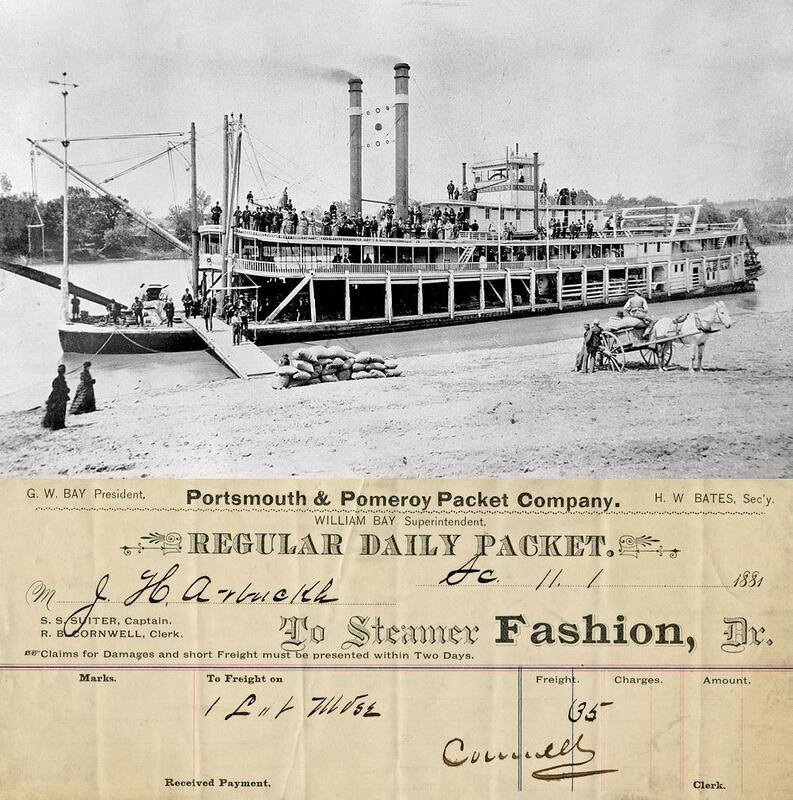 The White Collar Line ran her Cincinnati-Portsmouth, and later through to Pomeroy. On one occasion she came up to East Liverpool, Ohio with a special excursion, this was in April 1889. 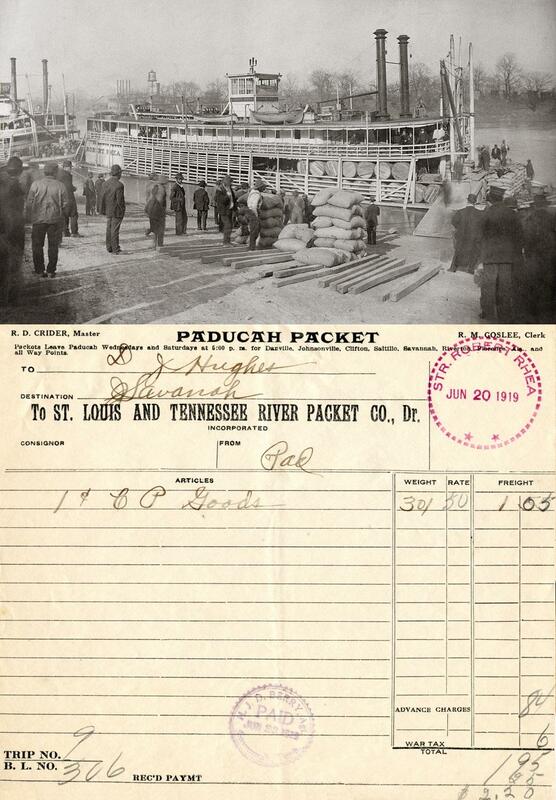 Also made Cincinnati-Memphis trips, bringing up baled cotton, cottonseed meal and stock. 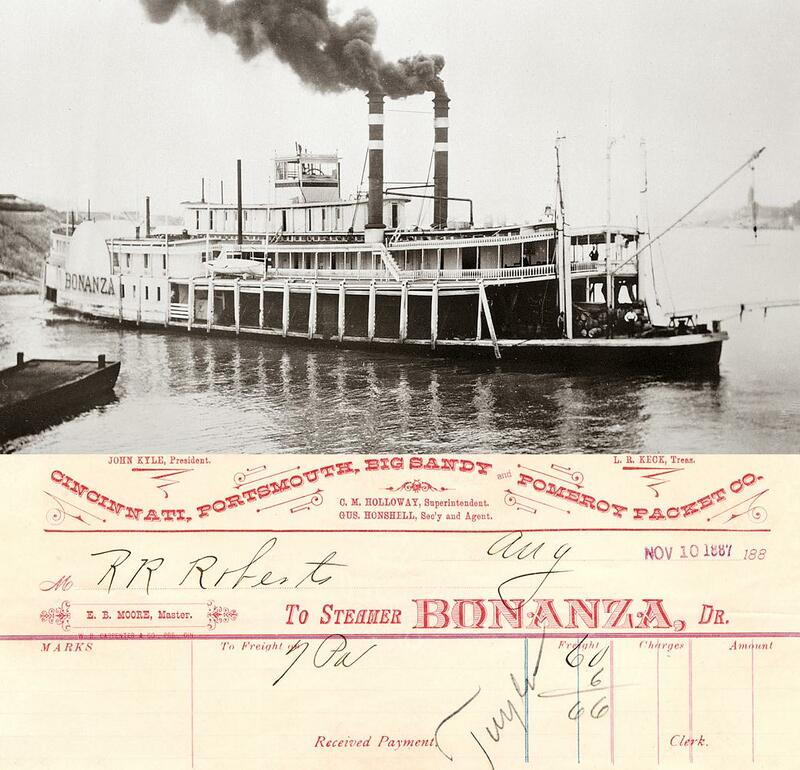 White Collar Line sold rights to upriver trade out of Cincinnati to the Greene Line in 1904 after which Bonanza was used below as a spare, and on Memphis trips. Dismantled at the Cincinnati wharf in May 1909 After dismantling, her whistle was on the CITY OF CINCINNATI, the KENTUCKY and last on the CINCINNATI. John Hartford wrote a book about the VIRGINIA called Steamboat in a Cornfield, published in 1986 by the Crown Publishing Group; now out-of-print but second hand copies can be found at abebooks. Built by the Cincinnati Marine Railway Company for the Pittsburgh & Cincinnati Packet Co. with machinery by Griffith and Wedge in 1895 at Cincinnati, Ohio, Construction was superintended by Captain J. Frank Ellison. She was known to be exceptionally quiet in operation. She had 50 staterooms in the cabin and 10 more in the texas. The cabin was white with panels of Lincrusta Walton. 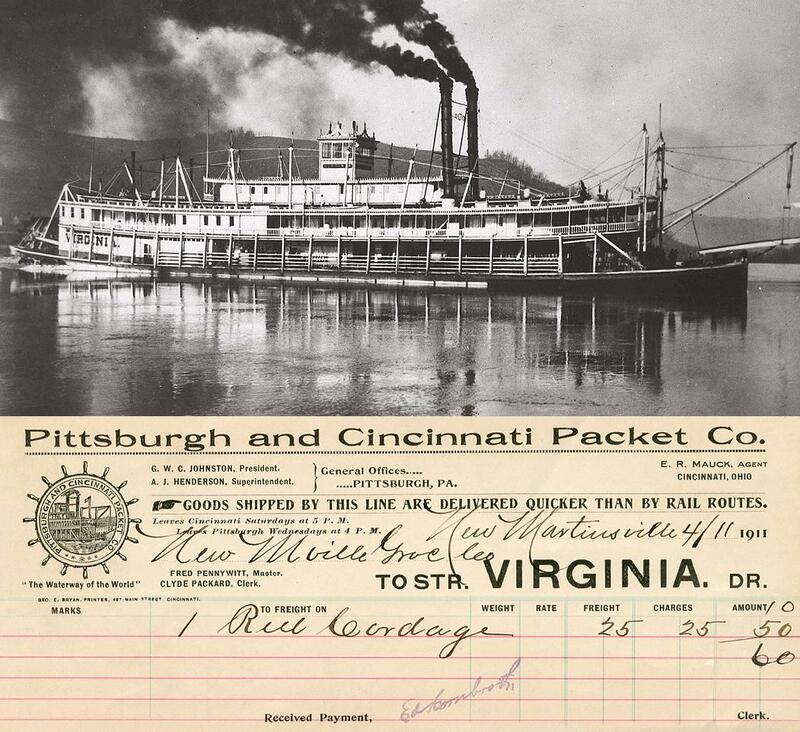 She was one of the first steamboats on the upper Ohio River to have a carbon arc searchlight contained in a glass fronted case with a reflector, called a White Squadron light which was imported from the Atlantic seaboard. She had distinctive arch hogchains, an innovation later used on other boats. 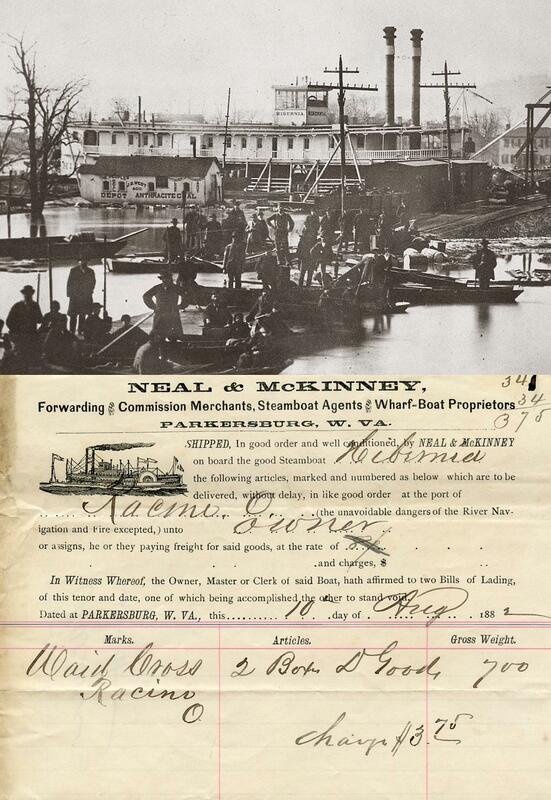 On March 3, 1904 she struck a submerged bridge pier at Steubenville, Ohio. Her hull was ruptured but assistance from the local fire department and from towboats Raymond Horner and Ironsides prevented her from sinking. She was the first packet to pass under the completed Wabash Railroad bridge at Pittsburgh in 1904. In 1909 her fancy-topped stacks were replaced with plain "towboat" stacks after she sank at the lower landing at Wellsville, Ohio on April 13, 1909. She had hit a hidden obstruction while backing away from the bank which caused damage to the hull and caused her to sink. Damage was estimated at $500. In early March 1910 she landed at Willow Grove, West Virginia to put off a passenger. While attempting to leave, she was carried over a submerged cornfield and became stranded. Damage to the boat was estimated at $4000. In a week's time the river was a half mile away and she remained high and dry in the cornfield becoming a tourist attraction. The John Eichleay Jr. Company, a contracting firm, moved her back to the river but she could not be launched due to the sandy riverbank soil. A rise in the Ohio River finally allowed her to move again. On December 18, 1911 she struck an overhead cable at the construction site of Dam 26 on the Ohio River which knocked down her stacks and tore up the pilot house. While having repairs made at Point Pleasant, West Virginia in 1912 she was renamed STEEL CITY. Formerly the VESPER (built in 1891 at Harmar, Ohio), she was rebuilt at Point Pleasant, West Virginia in 1897 and renamed the KLONDIKE. Ran in the Gallipolis-Syracuse trade originally. Between 1912 and 1915, she ran Portsmouth-Rome. May have been made into a towboat in April 1916. Built at Howard Ship Yards, Jeffersonville, Indiana, 1877 as a double-stage boat. Operated on the Ohio and Kentucky rivers. In June, 1890 while downbound at Riggs Landing, head of Manchester Islands, she hit the Kentucky shore at night and went down. Pilot Aaron McLaughlin had mistaken a lantern in a house as the government light. The cargo was principally Hostetter's Bitters, a cure-all of high alcoholic content made in Pittsburgh. Bottles were strewn all along the shore and were picked up for years after. 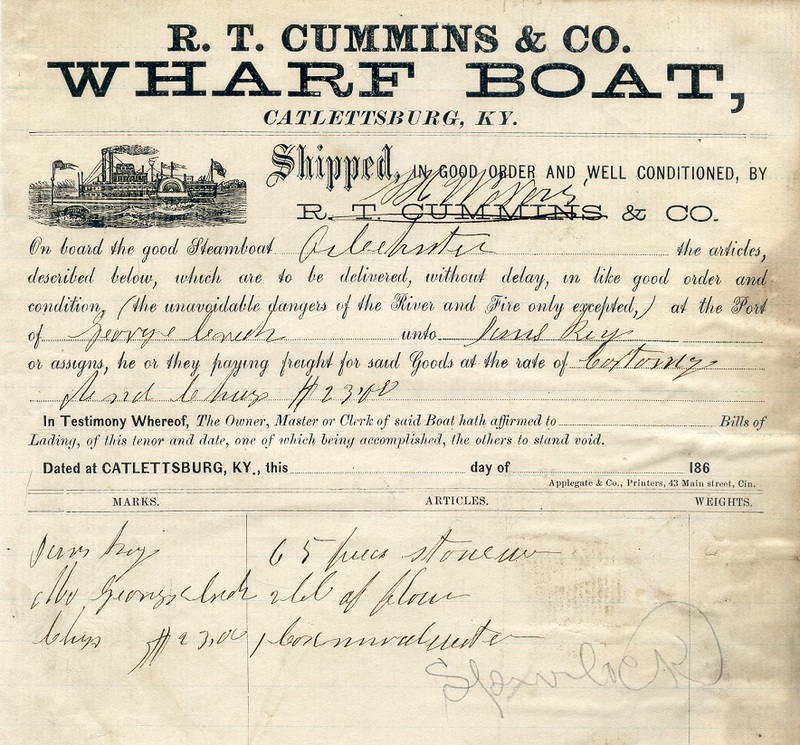 Attached from sometime in the 1860's a wharf boat receipt at Catlettsburg, KY for a steamboat with one of the most unusual names that I have ever heard of "OIL HUNTER." Don't know if this referred to drilling for oil or our hunting whales for their oil on the open sea. The clerk's handwriting is indecipherable but the name OIL HUNTER has been pretty well confirmed so we'll go with that and the brief mention of her in Way's directory below. Her engines were from the J.M. CAMDEN. In 1881 she ran Gallipolis-Marietta; in 1885 Gallipolis-Parkersburg. On January 2, 1885, she took passengers from the sunken TELEPHONE. Later, she ran out of Kentucky. She was too long for the Kentucky River locks and her forecastle had to be shortened. She was sold to Vicksburg and eventually acquired by the Parisot Line, run by Captain James Britton for the Belzoni trade. Captain James Britton ran her a few trips on the Sunflower River until she burned at the mouth of the Yazoo Canal, Kleinston, Mississippi on October 29, 1899. 1919 waybill for the ROBERT RHEA with a Murphy photo. She originally had no texas but may have acquired one while on the Tennessee River. She may have had a change in machinery around 1912. No mention is given as to what ultimately became of the boat.